Media captionBethan Hiscocks, a teacher from near Sennybridge, says "there's not much chance of getting out"
Heavy snow, flooding and high winds have caused widespread disruption across Wales. Sennybridge, near Brecon, Powys, has seen the highest snowfall in the UK - about 30cm (12ins) - and hundreds of homes are without power. Roads have been shut, some rail routes were blocked and police have advised people not to travel unless necessary. Nurses in the Cardiff and Bridgend area have been asked to work extra shifts. Cardiff and Vale Health Board made a social media appeal to boost staff numbers at its University Hospital of Wales and Llandough sites. A yellow "be aware" warning remains in place for much of Wales until 23:55 GMT, while a warning for ice for the whole of Wales has been issued for Monday morning. 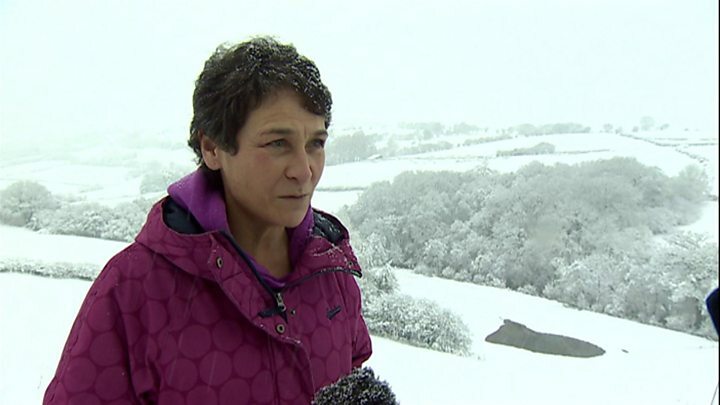 Meanwhile in Carmarthenshire, Coleg Eidyr, a residential college for people with learning disabilities at Rhandirmwym, near Llandovery, is without heat and electricity. 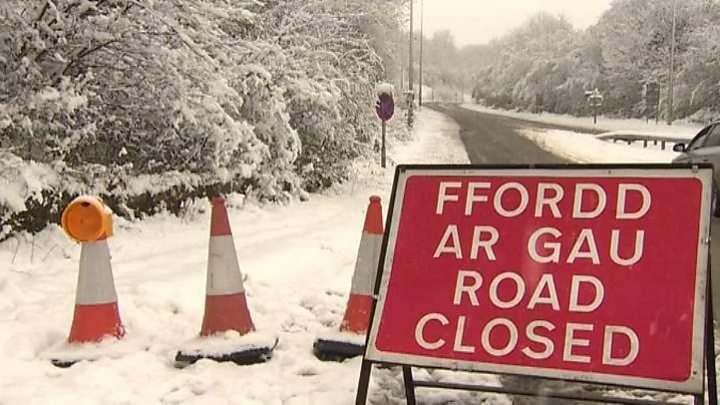 Among the roads closed, is the A4233 Maerdy Mountain Road between Aberdare and Maerdy in Rhondda Cynon Taff, while two milk tankers which came off the road in Llanilar, near Aberystwyth, had to be pulled free by tractors. Earlier on Sunday, two women were carried to safety by fire crews after their car became stuck in water at Kenfig Hill, Bridgend, while a stream broke its banks at Margam Village in Port Talbot. Flood water also left cars submerged in the capital and Vale of Glamorgan area with South Wales Fire and Rescue Service reporting water half way up vehicles. Western Power Distribution has said hundreds of homes in mid, west and south Wales are without power and advised residents to access its power cut map online. Scottish Power customers across north Wales can check supply status using its postcode checker. The 10:20 GMT flight from Cardiff to Amsterdam was cancelled and Cardiff Airport has advised all passengers to check its live flight information. A number of rail services have also been affected and Arriva Trains Wales has advised commuters to check if services are still running before travelling. Powys, Monmouthshire, Flintshire and Wrexham councils have already confirmed some schools will be closed on Monday, with warnings more could follow.